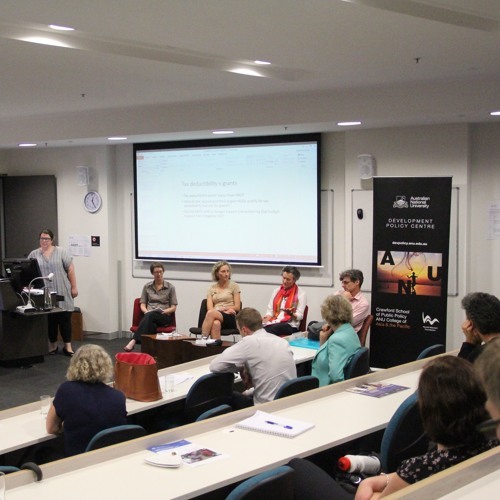 On Wednesday 9 December 2015, the Development Policy Centre hosted a forum to discuss and debate two recent aid evaluations by DFAT’s Office of Development Effectiveness (ODE). The event addressed the issue of development partnerships with a focus on two recent ODE evaluations of the Australian NGO Cooperation Program (ANCP) and Australia’s non-core funding to the Asian Development Bank and the World Bank. The multilateral banks and NGOs represent two of the Australian aid program’s more important delivery partners, and the evaluations contain a number of important findings and recommendations. This recording is of the second session of the forum, discussing the evaluation of the Australian NGO Cooperation Program (ANCP). This forum was the latest in a regular series built around ODE evaluations. It was presented by the Development Policy Centre at Crawford School of Public Policy, The Australian National University.